Audible Originals and the team from RiffTrax present an intergalactic tale of intrigue and Olympic heroism in this multicast, sci-fi comedy adventure! Kara Everglades has just finished her first year of high school and is longing for an adventure. So far, her only option is an invitation from some upperclassmen to watch them race a bunch of bullfrogs in a ditch. To be honest, she was hoping for something a bit more exciting. Her grandfather, Cornelius Everglades, is a family legend (and a loose cannon), who founded his own island micronation. Unfortunately, the rest of the world refuses to acknowledge it (possibly because he’s gone about the nation-building process using wildly illegal and unethical means). When Cornelius shows up at Kara’s door needing her help and promising an adventure, Kara agrees to go along with his far-fetched plan, even though a) she thought Cornelius was dead, and b) his scheme depends heavily on Kara wearing a mascot costume. If Kara had only known about the giant alien spaceship currently speeding toward her grandfather’s country with the intent to subjugate and humiliate mankind, she might have reconsidered. Full cast of voice actors and performers: Bill Corbett, John DiMaggio, Jackie Kashian, Colin Mahan, Kevin Murphy, Mike Nelson, Eliza Skinner, Dulce Sloan, Reggie Steele, Paul F. Tompkins, Janet Varney, Scott Vermeire, “Weird Al” Yankovic, and Sasheer Zamata. ©2019 Audible Originals, LLC (P)2018 Audible Originals, LLC. I loved this book so much that I spread the last hour out over four days so that it wouldn't end. Conor's writing style is fast and witty and the character voices take this to a new level. I listened to this during my daily commute and a couple of times at the gym and it made the time fly by. This was the first book I've read/heard by Conor but will not be my last as I immediately found his "372 pages I will never get back" Podcast to make up for my sense of loss once the book was over and will read "Gone Whalin" next. I will admit that the first 3 chapters or so did not seem like my type of story/ humor. However, once the story started to unfold and the more characters were introduced, I loved the ride. The production team hit it out of the park and the way they took the written book and made it into the audio version is brilliant with an All Star cast of actors. Treat yourself to 6 hours of fun, you will not be disappointed...well except when it's over. Mr. Lastowka, thank you for this fantastic story and I look forward to many more. For anyone who has been tracking the greats of American humor over the last 20 years, the stand-out cast of this audiobook will need no introduction: comedy legends from Mystery Science Theater 3000, Stan Against Evil, Futurama, BoJack Horseman and the entire decades of the '80s, '90s and '00s ("Weird" Al Yankovic) are all featured. Less well known but deserving of much wider recognition is author Conor Lastowka, who has honed his comedy-writing chops for more than a decade as lead writer for Rifftrax and as author of his previous novel "Gone Whalin'". The writing is sharp and breezy, as the story continues to build around the themes of family and flim-flammery, bringing to my mind what would happen if novelist Walker Percy wandered into a gonzo improv comedy sketch. 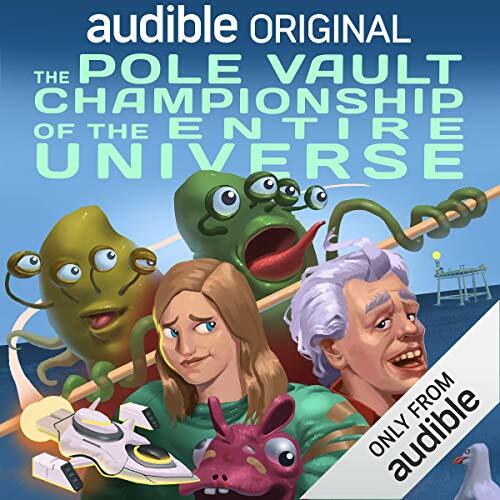 If you're looking for an audio escape or enjoy a good laugh out loud, make sure to attend "The Pole Vault Championship of the Universe" -- the fate of the planet could depend on it! all star cast, fun story, great narration. Good for business trips or daily commutes. Enjoy! Not just an audiobook but a performance! This have become on of my favorite audible purchases because it’s more than just a narration of a book but a real performance! Much of that success lies with the humorous writing of the author of the book. Lastowka does a great job creating a story that channels a lot of what make Douglas Adams and Kurt Vonnegut books so wonderful and loved. Humor, absurdity, and satire. I can’t wait to read more from the author and look forward to his next book. The other piece is the amazing performance created by the cast, the sound effects, and music. It meshes incredibly well and make this more like a audio play then the typical narration. The cast all does a fantastic job and the characters all feel distinct. If you are looking for something fun, different, and incredibly enjoyable I highly recommend this! I didn't know there was a way to possibly improve upon Conor Lastowka's sophomore effort, The Pole Vault Championship of the Entire Universe, but now there obviously is, and that is to recruit an All Star Cast to just crush it. Lastowka, a senior writer at RiffTrax, started off writing novels with the unexpectedly compelling tale of time travel and life on the open sea in the 2013 classic, Gone Whalin'. And in keeping with his ability to come up with names that tell you everything you need to know about a book, he followed it up in 2018 with this cosmic romp. And in doing so, he's positioned himself into a head start to being the definitive literary absurdist voice of the 2020s. He has such a unique voice and style, that to leave anything he writes on the shelf should be considered a very serious crime. But then there is this thing, something so amazing I can't even wrap my mind around it yet. The galaxy of A-list talent involved in this audiobook dwarfs anything that could be imagined in the Milky Way and Andromeda galaxies combined. MST3K/RiffTrax stars Mike Nelson, Kevin Murphy and Bill Corbett is just the beginning. You have Janet Varney, star of The Adventure of Korra, John DiMaggio, the voice of Bender from Futurama, Paul F. Tompkins of Mr. Show fame, and to top it all off, the king of absurd himself, Weird Al Yankovic. They are all on top of their game like you would not believe, every single one of them bring their A-game for an amazing experience you will not soon forget. If this cast telling this story is not enough to warrant the purchase and consumption of it, then I honestly do not know what would be. This has cult classic written all over it. Get it now so you can say that you "liked it before it was cool." This book is a riot. I was promised a laugh on every page, and while there are no pages, I put it at a laugh a minute. Now if only Audible could produce audio books of some of the other books I've been seeing around Amazon. Like this Tekwar that keeps getting recommended to me. I'll bet it's great too. A hilarious how-I-spent-my-summer-vacation story involving long-lost relatives, typographical fraud, humanity's first contact with an (arguably) superior alien race, a terrifying mascot, reverse limbo, rogue nations, and much more (including a useful tip for managing jet lag). The story quickly ramps up into an absurd, entertaining maelstrom that's nonetheless true to its own strange internal logic. Full-cast recording is terrific (not surprising given the performers). Zany Olympic fun with an all-star cast! If you haven't already read the brilliant comedy The Pole Vault Championship of the Entire Universe, here's your chance to listen to a hilarious audiobook version! Produced similarly to a radio play with sound effects, acted dialogue, and narration, Conor Lastowka's book comes to (bizarre and hysterical) life. The cast includes comedy greats such as Weird Al Yankovic, Janet Varney, and the MST3K/Rifftrax staff of Kevin Murphy, Mike Nelson, and Bill Corbett. AND MANY MORE! Come, join us on the micronation of Hawall. Slip on your grungy mascot costume and listen to its dark desires. Feel your moodcore glow with delight. It's time for the Olympics, and the aliens have just landed. Delightfully witty and absurd story brought to life by a great cast. You may not be a better person after listening to it, but you will be a happier one.